SRA recommends a reunion committee of at least 5 members must be established to assist with planning reunion events and to recruit fellow classmates to attend them. Advisory Services: A staff member is assigned to serve in an advisory capacity for reunion events. As the reunion host, you will have at least one program staff member assigned to work with you. Mailers: Addressed, stamped, and stuffed save-the-date reminders and invitations with all necessary information will go out to all prospective attendees for your reunion. The Association will take full responsibility for drafting, editing, printing, and mailing all marketing materials. Invitation Services: The Alumni Office will design, print, and mail an invitation to your guests. You will be expected to provide the information for the invitation and to proofread it before mailing. Web Page: Your class will also have a reunion Web page with details about the event, a link for online registration, and a list of committee members. Email Invitation: A save-the-date email invitation and reminder can be prepared and sent on your behalf to our online alumni community. Email Blasts: An email blast is an effective and cost-efficient way to communicate with a large number of people. Your staff liaison will create, schedule, and execute email blasts to your classmates who have given us their email addresses. Supplies: We will provide you with nametags for guests, SRA information, door prizes, and giveaway items for your reunion. Alumni Office Responsibilities: The Alumni Relations Office is responsible for approving venue locations, vendors, and deposits, and will sign all contracts as well as collect all registrations. For more information or to inquire about a reunion, please contact Aimee Tortolano at 401-723-8100 Ext. 155 or atortolano@saintrays.org. Include a “memorial table” so classmates can pay their respects. Campus Tours- A new and popular addition! A social hour with light snacks and drinks begins at the brand new, state-of-the-art, Joseph and Blanche Coutu Theater, if it is available on the date you choose. Other campus options may be available if not. Old friends greet each other, in the Navigant Art Gallery, with warm smiles and hugs and begin their merriment over refreshments. 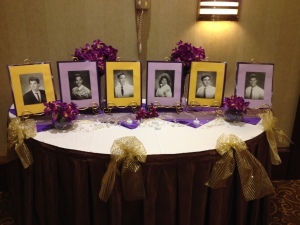 A table dedicated to the memory of those they’ve lost along the way is set up for class members to pay their respects. A full tour of campus facilities follows a greeting from the Principal and the Alumni Director. The nostalgia is tangible as the tour winds through their old hallways, visiting classrooms and cafeterias. Adding Mass to the beginning or end of the tour is welcome, and common, but not mandatory.